In a 5-0 vote, the Haverford ZB Chairman Robert Kane eloquently read the decision of the Board stating that Haverford Township showed that it DID not prohibit all outdoor advertising in Haverford as B.I.G. challenged. A vote was taken and the room, 2 thirds full, burst out into applause. Thaddeus Bartkowski III and Patrick Wolfington, principals of B.I.G. were not in attendance nor was B.I.G. attorney Marc Kaplin. As stated by Thaddeus Bartkowski in a recent interview on the Patch, an appeal will be filed. 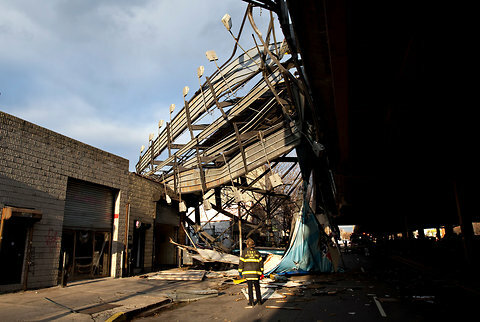 A billboard and its metal framework lay in wreckage along Meeker Avenue in Williamsburg, Brooklyn, on Friday after it blew over in high winds. An illegally placed New York Lottery billboard brought bad luck to drivers and buildings in Williamsburg, Brooklyn, on Friday when it collapsed in high winds — partly blocking the Brooklyn-Queens Expressway, knocking a hole in a body shop, severing a gas line and damaging a car, but injuring no one. The billboard, 20 feet by 60 feet and mounted on a six-story-high metal frame atop a one-story brick building at 421 Meeker Avenue, fell at about 2:20 p.m., the authorities said. The billboard landed on Meeker Avenue and on the guard rail of the elevated expressway. The billboard’s metal supports fell onto the building itself, partly collapsing the back wall, the Fire Department said. At least two other buildings sustained damage, the Buildings Department said.